Was wanting to use this as a tray rather than a hanging. Would that work? 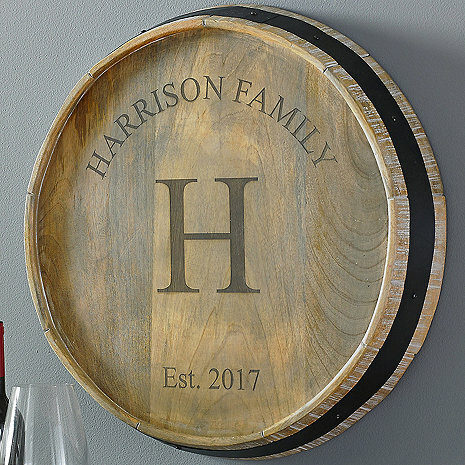 BEST ANSWER: What a great idea to use the Personalized Family Name Quarter Barrel Head Sign as a tray! As others have stated, you will need to attach handles. You might want to think about staining it to make it food safe. It only works as a tray upside down. You will not see the lettering. Can I do 2 initials in the center? Our last name is 2 words, 2 initials. Thank you. I was told that my item was to be delivered by 12/26 and it was not delivered. When I called I was told they could not answer my question and was short when trying to answer. Zero help. A wine chateau etching in the middle. Can we use a different font for our initial? BEST ANSWER: There were no other options as far as I could find. Can this be made with darker wood to be hung on outdoor fireplace? BEST ANSWER: I too would have preferred to order with darkwood but it wasn’t offered. Still quite pleased with the overall product! Can I do different engraving? For Example: Davis Vinyards one the top, then Fruit of the Vine, Work of Human Hands on the bottom? Are the words family (on line 1) and EST (on line 3) included? For example if I were to put ‘The Ranch’ on line 1, would it end up saying ‘The Ranch Family? I ordered this for a gift and was thrilled with it when it arrived. I ordered it over the phone with customer service and they were very helpful and professional. The item arrived before the promised by date in the midst of the Christmas rush. The family loved their gift. I would definitely recommend this item to others. It was perfect for the spot chosen for it. I am very pleased with my purchase. The quality and craftsmanship are excellent! The quarter barrel head sign surpassed my expectations. It is of great quality for the price. We hung it up immediately and looks awesome above our fireplace. There is nothing I dislike about it - my family is super pleased. I am so happy with this purchase! It’s absolutely beautiful and very well made. If you are a lover of wine, this also makes a great gift. The product is sturdy and of good quality. My only complaint is that the lettering is too light. There is not enough contrast so they dont stand out as much as I would have liked. I simply got a small brush and touched up the lettering with stain. Very easy to do since letters were "etched" and stain didnt run. Although my first barrel was misspelled, upon my call, was immediately remedied. It now hangs proudly on my "wine wall:. Satisfied overall, but personalization needs to be darker. Liked everything about it except the personalization wasn't near as dark/defined as in the product photo- it's much too light. The added definition would make all the difference. It is lighter in, reality, than expected. The contrast between the barrel top and our name is not quite as great as we would have preferred. That said, it will perform the desired function and we are delighted that we bought it.